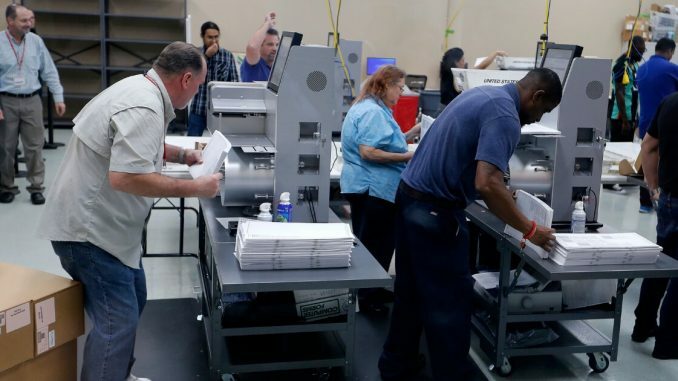 Last week, the Florida Department of State asked federal prosecutors to look into alterations made on official election documents from the 2018 midterms. Politico reported that the department points to the Florida Democratic Party for changing dates on forms used to amend absentee and mail-in ballots. These ballots would have been flagged for missing information or for being filled out with incorrect information. The amending forms, called “cure affidavits,” were due at 5 p.m on Nov. 5, the evening before Election Day, at the latest. During pre-Election Day absentee and mail-in voting, political parties have access to lists of people whose mail-in ballots were rejected for errors. Meanwhile, cure affidavits are publicly available and anyone can send them to voters to prompt them to “fix” their ballots. According to Politico, the DOS released affidavits on Tuesday, which demonstrate that four different counties said the ballots could be returned by 5 p.m on Thursday, Nov. 8, past the official due date. Among the counties involved with the altered affidavits is Broward, which has been a hotspot for controversy as many Florida races have led to a recount. Some people point to Brenda Snipes, Broward’s Elections chief, for her troubling history of election transgressions. Do you agree with the call for a federal investigation? Politico reported that they received audio of a Florida Democratic party volunteer leaving a voicemail to a voter in Palm Beach County to revise their mailed ballot after Election Day. Palm Beach County failed to make Florida’s recount deadline on Thursday. Matt Dixon, bureau chief of Politico, tweeted on Wednesday that the Democratic party volunteer call came during Florida’s ballot recount after ballots were allowed to be amended. “We are now doing a recount, so we want to make sure you let your vote be counted,” Dixon quoted from the voicemail. It seems that Democrats may have called absentee voters about supplying them with cure affidavits after the permitted date. It also looks like whoever sent out the cure affidavits physically changed the due date to say Nov. 8, instead of Nov. 6. Bradley McVay, DOS interim general counsel, asked attorneys in Florida to investigate the conflicting dates. “Altering a form in a manner that provides the incorrect date for a voter to cure a defect … imposes a burden on the voter significant enough to frustrate the voter’s ability to vote,” McVay wrote in a letter, sent on Nov. 9 and publicly released on Tuesday. According to DOS officials, they are less concerned with the inaccurate dates, and more concerned with the fact that the cure affidavits appear to have been deliberately altered. State officials turned over the altered forms to federal investigators. Of the many allegations of ballot mishandling in Florida, this is the first that has been referred to the federal government. While Democrats seem to have told voters they could fix ballot errors up to the Thursday after Election Day — these votes could not count. It looks like Democrats may have hurt their own interests by misleading their voters. They may have believed that they were supplying the correct information, but they still should not have altered official documents without verifying that they were right, which they weren’t. It is yet to be determined whether the federal investigation will find Democratic ineptitude or deception in this case.